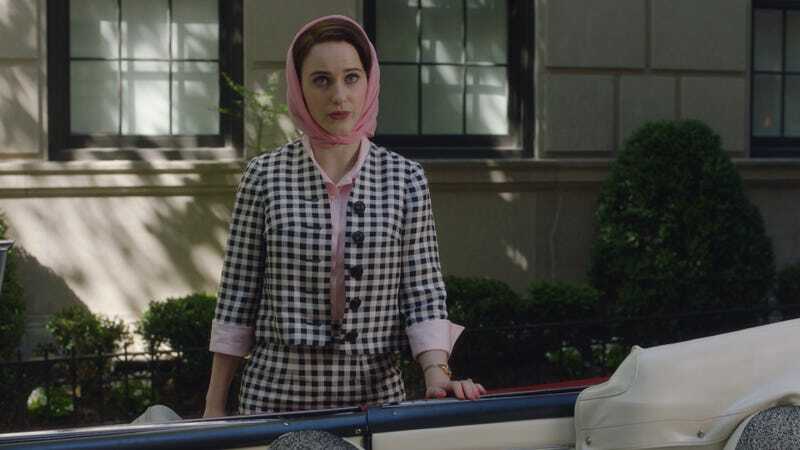 Throughout the first half of season 2, The Marvelous Mrs. Maisel has not only transported viewers to faraway places, but has also offered a more in-depth look at many of the show’s central characters. But “Midnight at the Concord” shifts the focus of the series back to Midge’s comedy career more directly. The girl may play a mean game of “Simon Says” but her time flitting about the Catskills has also been a couple of steps backwards in terms of getting her to think about what the next stage of her life is going to actually look like. At her best, Midge is ambitious and smart, but, at her worst, she can be self-involved, frivolous, and unfocused, all of which are starting to drive her manager (and perhaps some audience members) a little nuts. Lucky for her, Susie is still wandering around the mountains trying to secure Midge gigs, even though it looks like another Catskills crasher is on to her plunger trick. Still, you can see where Midge’s priorities are when she gets a call from B. Altman telling her she has her make-up counter gig back if she can show up to work in just a few hours. She immediately makes the choice to head back, not even taking the time to tell Susie where she is going. Midge is able avoid the horrors of taking a bus back to NYC by riding back to the city with Benjamin, who apparently only stays at the Catskills long enough to eat one box of cereal, which is possibly the best and quirkiest time keeping strategy I’ve ever heard of. They ride together in silence as the news drones on and on (Benjamin refuses to listen to music) until eventually Midge does a clever spoof of the newscaster they were listening to for the duration of the trip, a move that Benjamin clearly finds delightful. When the trip is over, he asks Midge for a date and romantic sparks are flying. It should be noted though that Midge is still clearly wearing her wedding band throughout the ride. Joel, meanwhile, has the potential to rebuild his whole life in the Catskills, with any number of admiring women flocking to his newly separated side. The only problem is that none of them are Midge. Joel may not be modern enough to be with a cool chick, but he also doesn’t want a pretty airhead; he wants someone he can actually have a conversation with. One of the most tender scenes involving Joel this season is actually a conversation with his mother, who is trying to encourage him to date. The whole time she is in the Catskills, she has insisted on wearing a gigantic fur coat in order to appear more affluent. “You look nice in your coat, Ma” he tells her. “But do I look rich?” she asks. “Like a Rockefeller,” he replies. The opportunities keep coming as Susie informs Midge she got her the midnight gig at the Concord, but that she has to return to the Catskills that night. Midge hitches a ride with her brother and sister-in-law, both of whom assume that Midge is all dolled up for a prospective date. Though Midge is at the point where she is able to tell a prospective suitor about her stand-up life, she is not at all ready to tell her family. The Concord is the largest and fanciest venue that Midge has ever had the opportunity to perform at and she hits the stage with the confidence of a woman who knows exactly what she’s doing. But as she looks out into an adoring audience, she sees one face who is not smiling. It’s her father, who got out of “Polynesian” night with the Maisels by playing sick, and he’s absolutely horrified to see his daughter on stage telling raunchy jokes, many of which are based on their family. When we first see both Midge and Abe lock eyes, it’s a moment of quiet terror. Abe doesn’t look repulsed or angry, so much as completely flummoxed. After all, he attempted to escape the classless banter of Joel’s parents, only to end up in a theater with his daughter telling even more ribald jokes. For her part, Midge is terrified, but also cannot stop talking, even creating humor based on the sad, strange situation of that very moment. “Midnight at the Concord” is about the safety of secrets. In season 1, her friend, Imogene told her that the most important thing she could do when Joel left her was to control the narrative, and, despite hitting rough patches for months, Midge has always been able to keep her private life away from Abe and Rose. But now, in the middle of season 2, we see Midge bringing the house down, while simultaneously blowing up her entire world. “I’m taking you home,” Abe tells her, putting on his gigantic straw hat with as much authority as he can muster. In the final moments of the episode, Midge and Susie sit in the back seat of Abe’s car, like two children who have been caught misbehaving. “Are we in trouble?” Susie asks, still holding her plunger like a beloved toy. For once, Midge is speechless as she nods and keeps on looking straight ahead.